While Ford Racing promises to be of huge interest to anyone with an interest in the famous car manufacturer's output, it ultimately proves to be little more than an average racer that is easily skipped. In concept, it's very similar to the idea behind Need For Speed 5: Porsche 2000 only instead of driving around in German supercars you're behind the wheel of the American giant's cars instead. There are a few modes to try out here with the main focus being the career option. 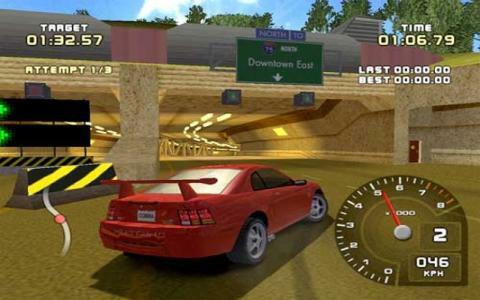 Here, you start out as a low ranked driver and must work your way up through a series of tough races, starting out with less powerful cars before gaining access to the hot stuff. This mode also gives you some customization options as you can purchase upgrades for your rides to improve your chances. 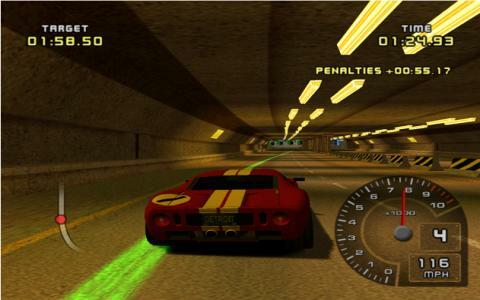 The other main mode is the single-player option which allows you to race freely on any course and with any car that you've unlocked in the career. There's a fair range of cars on offer too, with a number of versions of each one, spreading across the years from 1997 to 2000. Ford Racing isn't a terrible racer, it's just a distinctly average one. It suffers from the element which is its main selling point, the Ford license, as there simply isn't enough variety in the cars to really warrant your attention. The courses too are short while handling is ropey, collision detection very wobbly and AI distinctly second rate. The visuals too don't hold up well so when you add all this together, you're left with an underwhelming experience.